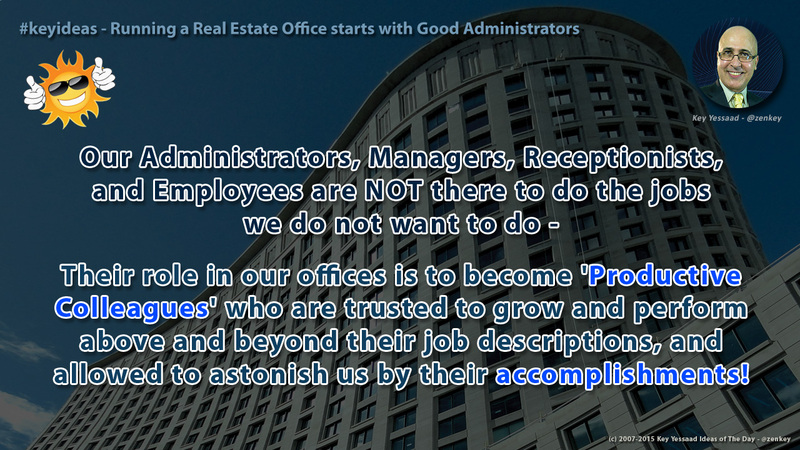 The normal Real Estate Office in America does not always behave like a Structured Business – a place where tasks are clearly delineated, brokers understand their managerial roles, administrators and staff with clearly defined job descriptions, and clear standards for hiring and firing Agents. In fact ‘Employees’ Job Progress Reviews’ are non-existent. This attitude is understandable since Owners/Brokers do not view their Real Estate Agents as employees; they are a kind of independent Commission Only Sales Associates who in essence run their own businesses and only get paid is they close a deal. But How about our Administrators, Office Managers, and Receptionists? They are employees and should and would benefit from Job Reviews if the Owners and Brokers understood the five Reasons such meetings are held. 1. To establish the Goals, Objectives, and Clarity of the Position the Administrator is responsible for; and continually refining it. 2. To establish Quarterly Long-Term Projects and manage Events and Business Calendars for the whole Office. 3. To eliminate the need to react to breakdowns by having a plan and awareness of potential pitfalls. 4. To reveal technical weaknesses is the Administrators and office members, then offer appropriate training for the long term success of all. 5. To head-off complacency that emerges for the day-to-day running of the business, and refocus the Broker on the Big Picture – which is: Helping the Real Estate Agents in the office Succeed. Some ask how often should Progress Review Meetings take place? – depending on the size of your office a biweekly (every 2 weeks) seems to work well, but at least once a month with Meeting Minutes written down clearly to be addressed at the next meeting so progress can be measured. Each Job Progress Meeting should be clearly marked in the calendar and should not be whimsically cancelled by the Broker. This is probably the biggest culprit in the breakdown of such meetings – the broker, who many times is also a Sales Agent, is at the mercy of the winds of their clients; and because the administrators work for them they think cancelling such a meeting is ok. It is Not! It shows a lack of respect to the professionalism of your staff and will have lasting negative consequences. Running an office starts with Good Business Decorum! Each Meeting should end with a Short List Action Plan that is accepted and clear to all. Make sure the action plan is measurable and achievable during the period agreed upon. Final Thoughts: Job Progress Meetings are not designed to fix whatever is wrong with your employees; they are meant to refocus the Managers and Brokers and the Big Picture of the Business, and align the vision of a core group of people towards Team Success. Nice post.Thank you for giving this informative blog.It is interesting to view this blog.All the readers will get some useful information from here.The language used here is simple and good.All the readers can follow this blog without any difficulty. Basically I'm a writer I would like to share my website here ( https://dissertationpanda.com/ ) and sometimes I wait for your post to get more this type of blogs. A good blog always comes-up with new and exciting information and while reading I have feel that this blog is really have all those quality that qualify a blog to be a good one.